2. Professor Hans Pettersson: “The Ocean Floor”, 1954. “… One is at a loss to explain how these products of a coastal shelf and supramarine vegetation could have been carried to the position of the find at lat. 7 29′ N., long. 45 I’ W.” (Pettersson, 1954). 3. Dr. Otto Mellis at Mineralogical Department, University of Stockholm, was also surprised by the layers of sand in core sediments from the Romanche Deep. He concludes that its origin is most likely products of erosion from the Mid-Atlantic Ridge, when it was more or less above sea level, and that it was formed as beach sand produced on a coast line, not in the deep ocean. Mellis, 1958 (4). 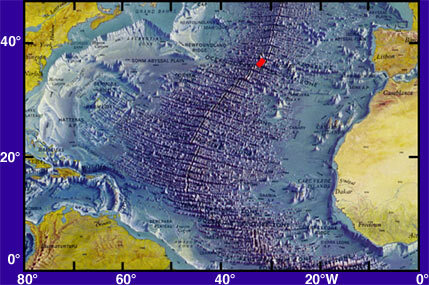 Woods Hole Oceanographic Expeditions to the Mid-Atlantic Ridge, 1948. Numerous samples of tremolite asbestos were brought up. “Sometime in the distant past this sand found deep beneath the ocean must have been located on a beach, at or near the surface of the sea.” Ewing, 1949 (6)It became obvious that granite and sedimentary rocks “which originally must have been part of a continent” were abundant (Ewing, 1949).Dr. Bruce Heezen, oceanographer with the Lamont-Doherty Geological Observatory, observed that this type of rock indicates “possible sunken land masses“. Heezen, Tharp & Ewing, 1959 (8)… some (geologists) even conceding that there might be enough continental material (sial) in the mid-Atlantic to make up a landmass the size of Spain. De Camp, 1970 (9). Heezen, Ewing, Ericson & Bentley, 1954 (10). ”The internal character and geometry of the interpreted seismic megasequences suggest that the Atlantis Basin is filled with a mixture of volcanic, organic, calcareous and siliciclastic sediments …”… “Most seamounts show a characteristic guyot or tablemount morphology demotion at or near sea level.” T.M. Alves et al., 2004 (12). “One of the most interesting observations was the unexpected presence of many fresh-water diatoms in certain cores taken by the Albatross parallel to the coastline of Equatorial West Africa at a great distance off the coast.” (c. 900 km).“My own investigations of the numerous cores collected by the Swedish Deep-Sea Expedition in the equatorial belt of the Pacific and Indian oceans did not reveal a single specimen of fresh-water species, except in the close vicinity of continents or large islands.The novelty of the present observations lies in the constant occurrence of fresh-water diatoms in Atlantic deep-sea cores, the large number of individuals, and the relatively great variety of species. According to the unique sources available to Ocean Islands Survey Group the Atlantic landmass disappeared c 12.000 BC. i.e. c 14.008 years ago. 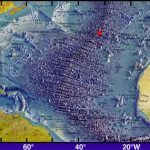 According to the sources available to Ocean Islands Survey Group the Atlantic landmass disappeared app. 12.000 BC. i.e. 14.008 years ago. R. Cedric Leonard stresses: “The point here, which cannot be gainsaid, is that Atlantis was known before Plato–so well-known that the sea outside Gibraltar was commonly called the Atlantis Sea in Herodotus’ time. It had acquired that name because Atlantis had once occupied that area.” (27). Love the post. I ‘d never thought of it in that method prior to.